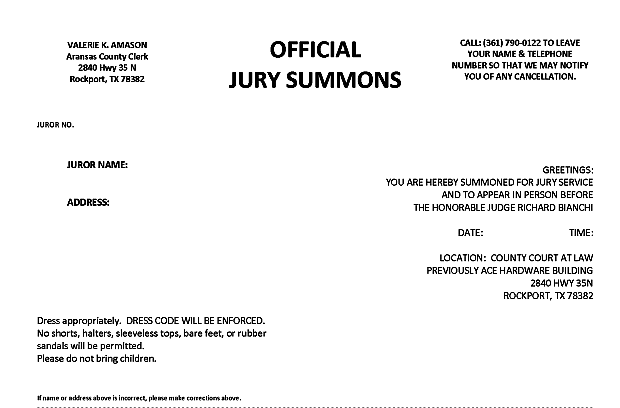 Click on the links below to get information about Jury Summons. Each summons is color coded to the issuing office. To claim an Exemption: Circle the exemption(s) that you claim, Sign the form. 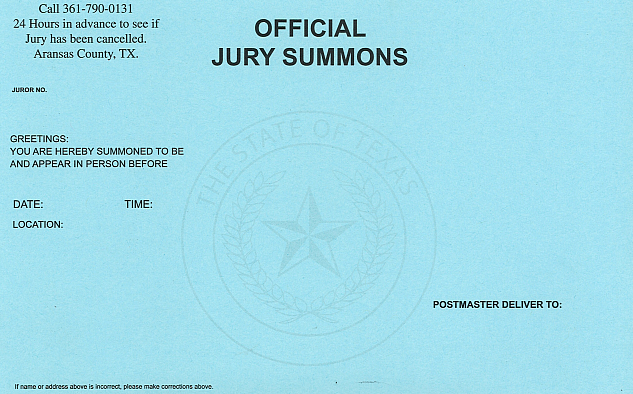 Mail or take the form to the correct office (see sample summons card above). NOTE: You do not have to claim an exemption and may instead choose to serve. If you are Disqualified: Circle the qualification(s) that you do not meet. Sign the form. Mail or take the form to the correct office (see sample summons card above). NOTE: If you claim to be disqualified because you are not a Texas citizen or a resident of this county, you may become ineligible to vote in this county. To Postpone your Service (District Court Summons Only): Contact the District Clerk's office at (361)790-0128 before your scheduled date of service. 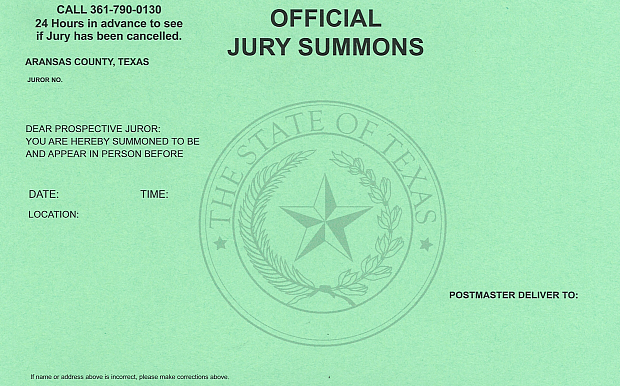 If you were summoned for jury duty for Monday, March 25, 2019 please arrive no later than 9:00 AM. The entrance to the District Courtroom is down the right hallway; first set of double doors. Please enter through front doors of the building at 2840 Highway 35 N; the Old Ace Hardware. 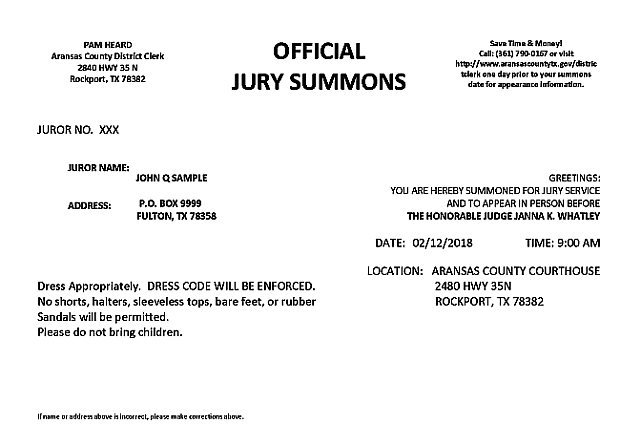 Bring your whole card, a pen, and please dress appropriately (shorts, cut-offs, pajamas, and similar attire will not be allowed into the courtroom). Do not bring cellphones into the courtroom, they will be confiscated, and returned at the end of the day, if they go off during, or disrupt court proceedings.